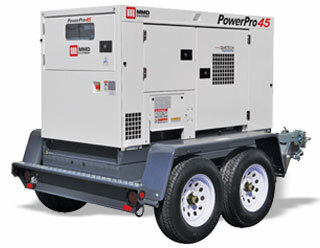 25kVA Towable Generator Rental – MMD PowerPro 25, is available for rent in Rochester NY, Ithaca NY and the entire Western New York region from the Duke Company. The MMD PowerPro 25 generates 25kVA / 20 kW of prime power and automatically adjusts voltage output when variable loads are applied. Equipped with sound reduction technology, this generator is suitable for a wide range of applications including powering events. Three Phase 480V 30 Amps.